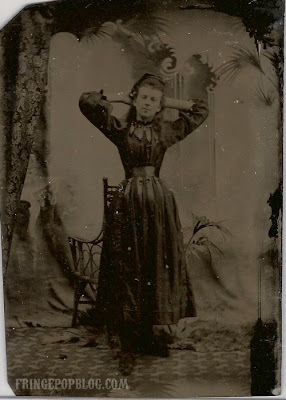 The woman in this tintype is posed unusually. The typical pose was usually much more formal--perhaps standing with your arms rigid to your side or sitting with your hands placed in your lap. This woman, on the other hand, is posed in much the same fashion as modern day bikini models sans the bikini. When I pick up odd photos such as this, I often wonder what the context was? I think she is probably a gypsy (or trying to be one!) because of her pose and the bells on her dress!